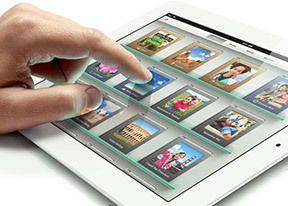 Users coming from the iPad 2 won't feel a performance increase. The new iPad feels exactly the same as the old one and that's pretty fast and fluid. We never had a problem with the performance of the iPad in the first place and it still goes without glitches. The new iPad (3) has a dual-core processor with each core clocked at 1 GHz and 988 MB of RAM but where it gets really interesting is the GPU - it's a PowerVR SGX543MP4 unit with four cores. It's the same as the one in the PlayStation Vita and it really is powerful, handling both the intense graphics of games like Infinity Blade II and the quadrupled screen resolution. 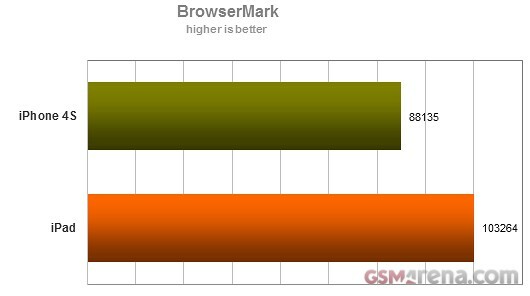 We ran a couple of benchmarks on the iPad, comparing it to the iPhone 4S. 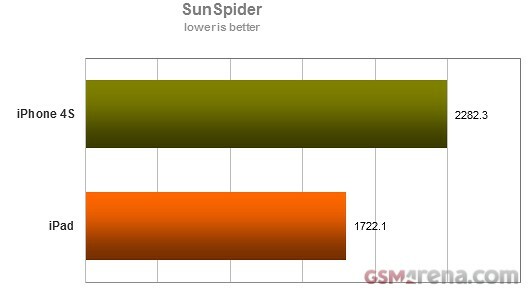 In both tests the new iPad beats the iPhone 4S, which could be due to the new GPU because both devices are using the same iOS version 5.1. Many users were disappointed by the dual-core processor and wanted a quad-core one but the truth is that the iPad is zippier than ever and is hard to imagine it being faster. Gaming performance is duly covered with the new GPU but we guess battery endurance and app launch times could've been improved by a new CPU. As expected, the iPad comes with iMessage - it lets you exchange instant messages between iOS 5-running iGadgets via Wi-Fi or 3G. You can send plain text as well as multimedia (pictures, sounds, videos) messages. The app stores all your messages within threads and offers options for mass delete and forwarding. There is a search field, MMS support (if you choose to attach a multimedia file) and character counter. iMessage gives you delivery reports too. Email supports multiple accounts (configurable in the Settings app) and offers Universal Inbox (showing all your mail at once). The Mail app also supports threads, email archiving and quick lookup of documents thanks to the integrated document viewer. There is also an Open With… option, offerings depending on what you have installed (PDF reader, mobile office, iBooks, etc). In portrait mode the left bar with all your emails remains hidden until prompted while in landscape you get both the inbox/emails bar visible and the email you've opened is on the right. If you open your Inbox and hit the Edit button, you now have a Mark key alongside Move and Delete. You can now mass mark emails as read/unread or flag them as important. Unfortunately, a "Select All" option is still missing. Bold, Italic and Underline font styles are added to the text editing options as well as quote font size levels. Text selection works the usual way (tap&hold&select) and the available options will appear as soon you've made the selection. Siri didn't make it on the new iPad but Apple did make dictation a feature available throughout iOS. It's available in Notes, Email, iMessage and any app that integrates it. It works just like on the 4S - hit the corresponding button your keyboard and start dictating. The Notes app is exactly the same as before. You get the familiar dual-layout with the notes you've saved on the left and the note input screen on the right. Your notes are also synced with iCloud so you won't have to worry about losing any of them. The phonebook on the iPad is the same as the one on the iPhone - Contacts. It lists all of your acquaintances complete with multiple email, number, address and other fields. You can set different tones for each contact, work details and you have convenient send message and share contact shortcuts available. We performed our traditional loudspeaker test on the new iPad and it got a Good grade. It's definitely loud and louder than the iPad 2. Calendar on the iPad uses the screen estate very well giving you dual-screen viewing - the date on one side and the agenda view on the other. You can view your events and tasks by day, week, month, year or as a list. You can also opt to view appointments from your iCloud, Exchange, Google, Yahoo, etc. or all of them at the same time. There's a handy option to view Birthdays too. The separate Reminders app has a simple interface but it does a nice job. You can set to be reminded on a day or at a location (you'll need a GSP-enabled iPad). When a reminder sets off, you see it as a standard notification - on your lockscreen, the Notification Center and the homescreen (as a banner or a pop-up).